Life 2.0 | This feature length documentary follows a group of people whose lives are dramatically transformed by a virtual world — reshaping relationships, identities, and ultimately the very notion of reality. Roco Films | Every day, across all corners of the globe, millions of users log onto Second Life, a virtual online world populated by real lifelike avatars. 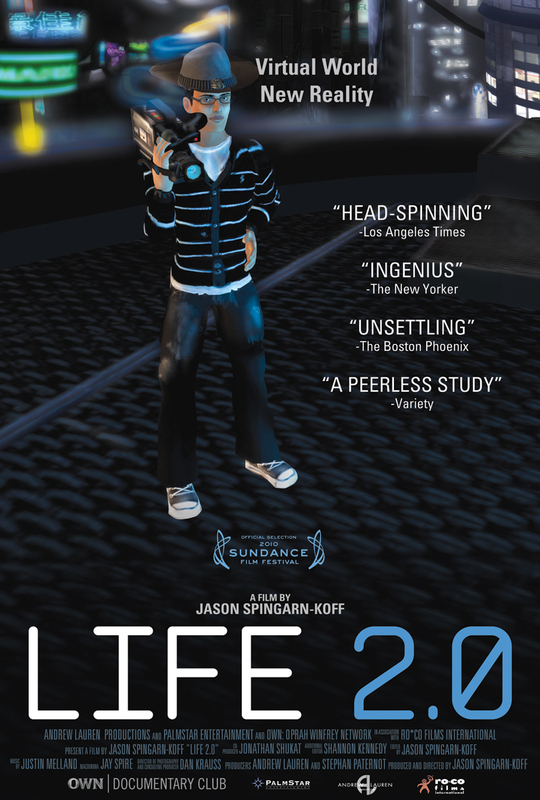 Life 2.0 follows a group of people whose lives are dramatically consumed by the virtual world of Second Life. They reside in this new reality, where inhabitants assume alternate personas in the form of avatars — with digital alter egos that can be sculpted and manipulated on a whim. More than an examination of a hot new technology, Life 2.0 is an intimate, character based drama about people who look to a virtual world in search of something they are missing in their real lives. The results are unexpected and often disturbing: reshaping relationships, identities and ultimately the notion of reality. Sundance Film Festival | About the film Life 2.0. Every day, across all corners of the globe, hundreds of thousands of users log onto Second Life, a virtual online world not entirely unlike our own. They enter a new reality, whose inhabitants assume alternate personas in the form of avatars — digital alter egos that can be sculpted and manipulated to the heart’s desire, representing reality, fantasy, or a healthy mix of both. Within this alternate landscape, escapism abounds, relationships are formed, and a real world economy thrives, effectively blurring the lines between reality and virtual reality. Director Jason Spingarn-Koff digs deeply into the core of basic human interaction by assuming his own avatar and immersing himself in the worlds of Second Life residents, whose real lives have been drastically transformed by the new lives they lead in cyberspace. In doing so, he manages to create an intimate, character based drama that forces us to question not only who we are, but who we long to be.